WILLEMSTAD, SAN JUAN – Next year Curaçao is going to the Gold Cup for the first time ever. Last night the soccer team won in Puerto Rico with 4-2 during the extra time. The team led by coach Remko Bicentini qualified not only for the next round of the Caribbean Cup but also automatically for the Gold Cup. 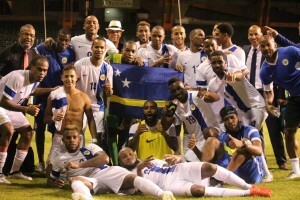 Curaçao’s double wins placed the team at the top of Group 3. Earlier the team won the match against Antigua and Barbuda by 3-0. That was an easy win, according to the soccer players. Last night it wasn’t so easy against Puerto Rico, which led in the first half by two goals from Hector Ramos. After the break, Rangelo Janga and Leandro Bacuna made sure that the match would go to extra time by scoring two goals for the Curaçao team. Feliticiano Zschusschen and Bacuna determined the final in extra time by scoring two more goals for Curaçao.